Only 7 percent of plastic waste in the United States is recycled each year, according to the Environmental Protection Agency. A startup company in Niagara Falls says it can increase that amount and reduce the country’s dependence on foreign oil at the same time. It all starts with a machine known as the Plastic-Eating Monster. Thousands of pounds of shredded milk jugs, water bottles and grocery bags tumble into a large tank, where they’re melted together and vaporized. This waste comes from landfills and dumps from all over the United States. “Basically, they’ve been mining their piles for us and sending them here,” says John Bordynuik, who heads his namesake company, JBI Inc. 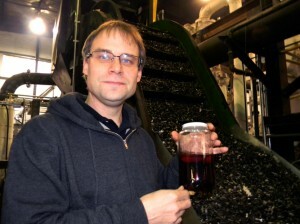 He invented a process that converts plastic into oil by rearranging its hydrocarbon chains. According to tests by the New York Department of Environmental Conservation, JBI’s patented technology is efficient, with close to 90 percent of plastics coming out as fuel. Bordynuik says that makes the case for this kind of recycling to go mainstream. JBI executive Bob Molodynia points to a spout at the other end of the plastic-eating machine, where a thin, brown liquid drips out. Each barrel of oil costs about $10 to produce. JBI can sell it for around $100 through a national distributor. The young company is already producing a few thousand gallons of oil a day. It has signed lucrative deals to set up operations next to companies with large volumes of plastic waste. But in its rush to grow, JBI has been accused by the Securities and Exchange Commission of overvaluing some of its assets in order to raise more funds. If JBI has its way, plastics will become a significant source of domestic fuel that reduces the U.S. dependence on foreign oil. But just how “green” is JBI’s recycling, when it produces a fossil fuel that pollutes just like any other? “To enter themselves into this industry, I think that they’ve all bought into the idea of producing a fuel,” says Carson Maxted of Resource Recycling, the plastic recycling industry’s trade journal. Maxted says he’s not sure whether converting plastic to oil can be considered recycling, or even environmentally friendly. But he says JBI’s methods can co-exist, and even complement, current recycling practices. And because there’s no lack of waste-plastic supply, and no lack of demand for oil, Maxted says the technology has the potential to transform both industries.